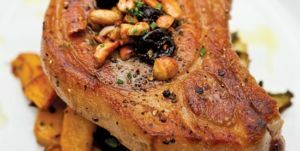 Northern Michigan Foodie: Check out Mike Salamunovich's recipe for Pan-Seared Pork Chops and Roasted Vegetables with Brandied Cherries and Cashews. The local ingredients make this dish oh-so-fresh, and oh-so-delicious! Click here for Mike's Seared Pork Chop with Roasted Vegetables recipe! This recipe was first featured in the March 2012 "Best Eats" issue of Traverse, Northern Michigan's Magazine. Get your copy here for more foodie finds!